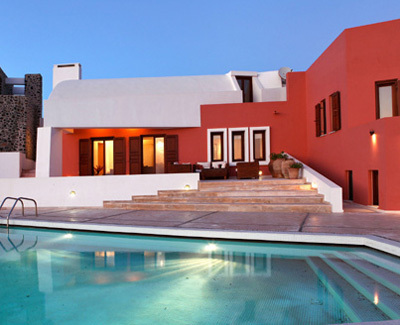 Periscope Villa in Santorini is a 4 bedroom ultra-luxury villa situated in a private land of 4000 sq. meters in Imerovigli overlooking the volcano and the sunset. Panoramic views, privacy, serenity, comfort, style and luxury are the distinctive characteristics of this villa. There are 2 entrances in the house. One is the main door that enters at the main entrance of the house through an exterior path in the back courtyard of the villa. A second private entrance is situated behind the doors of the private garage for maximum privacy and security and it would be perfect in case for VIP and celebrity guests that want to protect their privacy. The location of the villa is on the top of a private land of 4000 sq meters with no neighbors next door and it can offer maximum seclusion, privacy and panoramic views all around the island. This wonderful villa is the home of a renowned Greek architect who lives on the island and its distinctive design combines Santorinian traditional vaulted ceilings combined with futuristic lines and forms. The interior of the house is stylish and luxurious and it has all the modern comforts and amenities that the most demanding traveler would require. The house follows the flow of the earth with many levels as the architect respected the natural shape of the ground On the ground floor of the villa is situated an open plan area with a comfortable sitting room and a spacious dining area for 6 persons. Light comes through the balcony doors and the numerous windows on the vaulted ceilings. The wooden floor and the luxury furnishing reflect the quality of the villa. From the dining area a few stairs up take you to the bedrooms hall way that leads to the luxurious master bedroom of the villa with king size bed and Jacuzzi bathtub within the bedroom. The bedroom is attached to a large dressing room and luxury bathroom with two sinks and a luxury steam- hydromassage shower enclosure. There is a second queen sized bedroom with en suite bathroom with shower cabin next to the master bedroom. Both bedrooms have exit to balconies with sea views. From the bedroom?s hallway a stair lead us to a TV room with a lounger TV, dvd and home theater system. From the sitting area another hallway, the library hallway, takes you to the office -library of the house with a massive wooden office and a library where you can work uninterrupted. The office exits to a balcony with sea view. A guest WC with shower serves both the sitting area and the office. On the lower level of the house there is a corridor that takes you to a double bedroom with king size bed, a sofa that opens up to a double bed , en suite bathroom with shower cabin and a private terrace with fantastic sea view and an outdoors lounger. Next to the bedroom there is a laundry room equipped with washing machine, clothes dryer, and ironing board. There is also a guest WC serving the level. A state of art kitchen with all modern appliances and a dining table is situated at the end of the corridor. The kitchen is well lighted from a few windows with sea views. There is also a door that leads out on the pool area. At the end of the corridor a door takes you down to a basement with a large colorful room with twin beds that can serves as extra bedroom or personnel bedroom. This room although it is spacious and well equipped it has no windows. Except the corridor inside the hosue, the access to this room can be also from an independent entrance connected the back terrace of the house. The house has large exterior grounds. On the front there is a large courtyard with fantastic sea views and beautiful sunsets. In front of the living area there is a terrace with an exterior lounger for relaxing moments. A few stairs takes you down to the pool level where you find a wonderful pool with sunbeds and a shaded pergola with table and chairs all these with the most fantastic views and sunsets. A pool shower is also available. There is also a wonderful outdoors Giant Chess on the pool area in case you feel like for a chess game. On the back terrace of the house there is a quiet lounge area and a small basketball court. The house is equipped with wooden floors, Clima system - cooling and heating, Wi Fi, solar system and boiler with 24 hours hot water, energy saving systems, laundry room, fireplace, hi-fi, satellite tv, dvd, home theater.